Make your outdoor wedding perfect and use the wedding facility offered by O’Brien’s Sleepy Hollow in East Aurora, New York. When it comes to choosing ceremony locations, our venue can’t be beat. With 75 years of family tradition behind us, our banquet facility is a perfect place to host your special party or event. Since 1937 our home cooked food, scenic grounds and festive atmosphere have made O’Brien’s Sleepy Hollow Western New York’s best kept secret. The grove and banquet facility is nestled along side the Buffalo Creek on 5 acres of the most beautiful land in Elma, NY. We also offer drop off catering to your special event. Whether it be in your backyard garden or a business luncheon let us take the stress away as we deliver the best in homemade food to you and your guest. Please click on the catering tab to learn more. 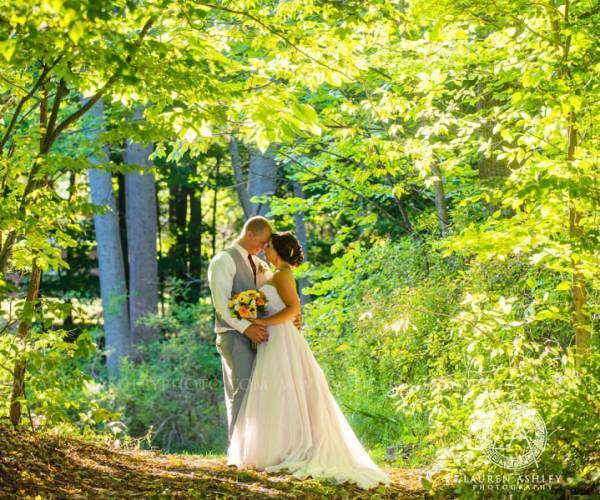 "I absolutely loved having our wedding at O'Brien's Sleepy Hollow! Dennis and Julie were wonderful to work with. They had the perfect balance of professionalism and a no-pressure, relaxed approach to help me plan our wedding. I wanted a venue that would have great food, be beautiful, affordable, and accommodate our guests. I got all of this at O'Brien's. It is clear that they only make high quality food, which I know can sometimes be difficult when feeding a large amount of guests. O'Brien's does a wonderful job at maintaining high quality service and food, even for large crowds. Dennis and Julie are so personable. I always felt like they were putting forth their best efforts to help us have a wonderful wedding. Many of our family members said it was the best wedding they've ever been to. I was a little wary about it being mainly an outdoor venue, but O'Brien's has everything figured out in case of rain. O'Brien's understood what Brad and I were about. Allie and Brad"